Venue: Motorpoint Arena, Cardiff. Date: 16-22 February. Coverage: Live and highlights on BBC Wales TV, the BBC Sport website, BBC iPlayer, mobile and the BBC Sport app. World number six Judd Trump says it is "more or less an impossible job" to attract British youngsters to snooker. Trump, 25, compared snooker's profile in Britain with that of China, where he says the sport is seen as "cool". 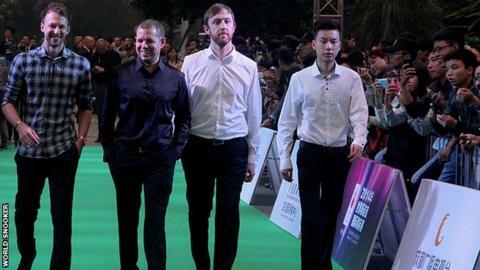 "Snooker has taken such a step down I am not sure it will recover unless five Ronnie O'Sullivans come along at the same time," Trump told BBC Sport. World Professional Billiards and Snooker Association (WPBSA) chief Jason Ferguson strongly rejects the claims. He says viewing figures are "huge" among young people. "We are now taking snooker to the people and they enjoy it," said WPBSA chairman Ferguson. "We are starting to see 14, 15 and 16 year olds breaking into the game so there is an increase in participation from young people too. "There was a decline in snooker after the boom in the 1980s but there are so many things going on now, it is certainly not an impossible task." Four ranking tournaments - the Wuxi Classic, Shanghai Masters, International Championship and China Open - now take place in the Far East, for which the prize money totals £2.02m. Despite the three British ranking events - the UK Championship, Welsh Open and World Championship - equating to £2.35m, Trump feels more investment needs to be made. "In my opinion, it is about money," said Englishman Trump. "That is what takes top credit in all the newspapers here. "Kids are always looking up to footballers because they are always on the front pages, but in China and other places, it is purely about the game itself. "You are never going to get snooker on to the front pages because there is not enough money in the game here. "I don't think you will ever get on a par with other sports because there are not too many big sponsors." Ferguson said he disagreed with Trump and added: "Our sport is governed completely differently to how it was done 10 years ago. "[We] have a responsibility to grow the sport and it is working. We have £8.6m in prize money now compared to £3.5m only four years ago. "We also have a 35% increase in the uptake of girls wanting to play. "We're taking it to different corners of the world and I want snooker to be taken seriously as one of the world's great sports like football, tennis and golf." According to Sport England's Active People Survey for over-16s there has been a significant fall in people getting involved in the sport, with a weekly participation figure of 112,600 in 2005-06 dropping to 47,700 in 2013-14. And in the world rankings list only Welshman Michael White, 23, and Scotland's Anthony McGill, 24, are younger than Trump in the top 32. "We are now heavily investing in various projects at grassroots level. The enthusiasm from people is amazing," said Ferguson. "Last year we launched 'Cue Zone' into schools [WPBSA's grass roots development programme]. All snooker players are great mathematicians and this engages young people. It works as a social interaction too." Trump, who won the 2011 China Open and 2012 International Championship, says the sport is "massive" in China, where many youngsters idolize Ding Junhui, the 27-year-old former world number one. Trump adds: "I visited a couple of schools where snooker is on the curriculum. They go in everyday and play snooker. "In the future, all the top players will be coming from Asia and the Far East. "It is also seen as a cooler sport than it is perceived here in Britain. It is definitely going to keep growing over there. It is going to take off and we just need to keep it going." World Snooker chairman Barry Hearn has always stated that the World Championship will not move from the Crucible in his lifetime, but does the 2011 runner-up Trump agree? "I don't think it will move because there is too much pride for the tournament to leave Sheffield," he said. "Eventually there will be a tournament on a par with the World Championship which will be a massive tournament over in China, but for now, it will stay here."